Had a little ride on my dad's Norton bike and thought some photos on it would be fun!! I fell in love with this classic bomber jacket without sleeves that Buffalo sent me. This is so in for fall and I think it is just fabulous! You look beyond badass, not to mention like a totally legit model as well! 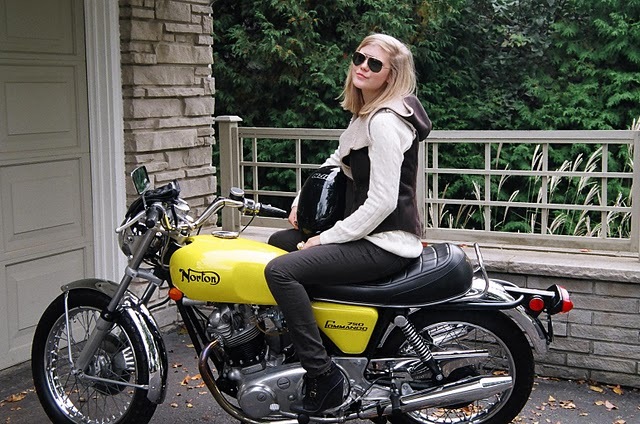 You are totally rocking this look and these pics are so badass on that motorcycle! This is awesome! Nice bike!! you look absolutely amazing, your outfit is perfect...and your dads bike is dope! i love your bomber jacket! That vest is amazing! And I wish I knew how to ride a motorcycle!